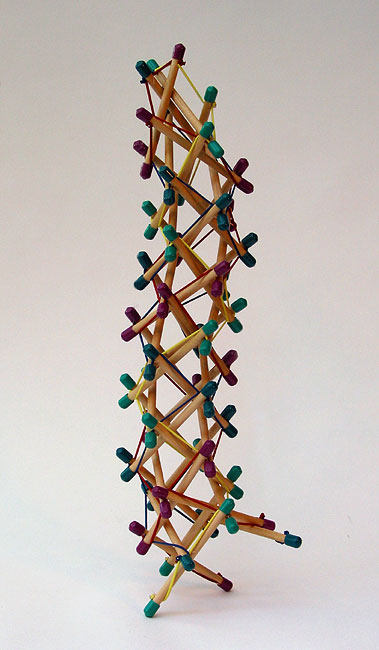 Read here about Tom Flemons, a leading creator of commercially available tensegrity models. Flemons is also the creator of the Skwish , a children's toy that has sold millions of models to date. 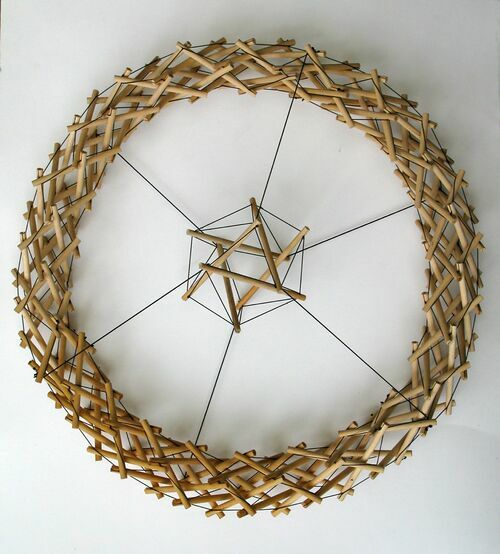 Tom Flemons of Intension Designs has been creating tensegrity models and sculptures for decades. His most recent work focuses on human anatomical structures, and his studio now offers these models for sale to clinicians and healthcare professionals. Be sure to read his article, The Geometry of Anatomy - the Bones of Tensegrity on his website. 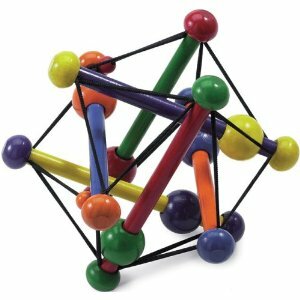 From his http://www.intensiondesigns.com/%7Cwebsite: Tom Flemons is an artist and inventor that has employed tensegrity principles for 30 years to design portable structures, free-standing fences, children's toys (Skwish), furniture, mobiles and sculptures. 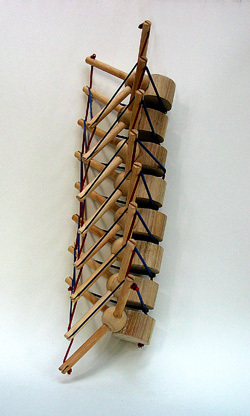 He first noticed the formal resemblance between tensegrity masts and vertebral 'columns' in 1985 and built several models of a tensegral spine which he sold to doctors and chiropractors. A search of the medical literature on bio-mechanics revealed no one was exploring the similarity of spines and tensegrity masts. However an orthopedic surgeon - Dr. Stephen Levin was writing about the connection and eventually he and Tom met and began to work together in the 90's. For over ten years, in collaboration with Dr. Levin, Tom has built many bio-tensegrity analogs of vertebrate anatomy and it has proved quite possible to model the body using tensegrity. Each iteration approaches a better accuracy and resolution of anatomy and in turn sparks insight into an explanation of bio-mechanics that does not require levers and fulcrums. Flemons occasionally posts videos of his dynamic models. Above, a three fold tensegrity spiral mast composed of wooden struts and an elastic tension net is actuated by using three vertical control lines. (For greater control, six control lines are needed). The mast illustrates the force vectors active in living forms such as an octopus, an elephant trunk, or a cat's tail. It also schematizes how fascial support in the spine can assist in lateral and rotational movement but also provides stability by stiffening the mast when required by tightening the control lines. We divide Flemon's work into biological, anatomical models and non-human anatomical models. 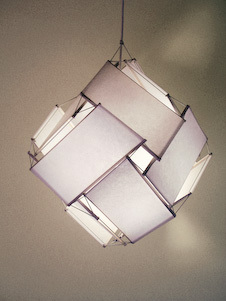 The images are from http://www.intensiondesigns.com/gallery_sculptures.html. 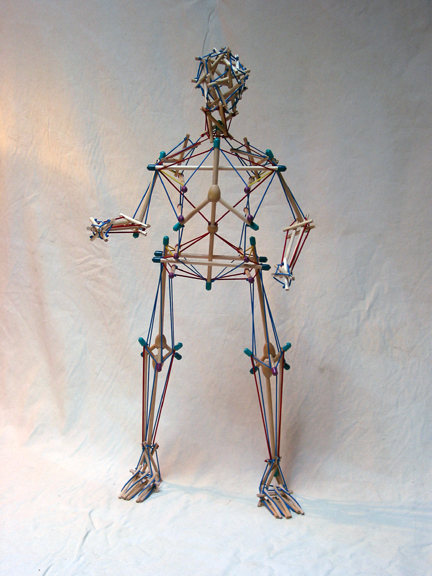 The following tensegrity models represent human or animal anatomical forms. Albert Full Skeleton by Tom Flemons"
[[file:Right_upper_extremity_icosahedral_model_by_Flemons.png|thumb|500px|none|Right upper extremity modelled as a sequence of interconnecting icosahedral tensegrities with compression struts of different lengths. Model by Flemons." 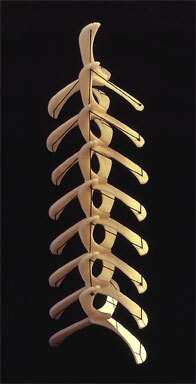 For more information, see spine. Spine, tetrahedral vertebral mast, model 05-TVM-3by Tom Flemons"
Spiral Vertebral Mast by Tom Flemons"
Thoracic vertabrae by Tom Flemons"
For more information, see pelvis. The Skwish, a commercially produced and sold toy designed by Tom Flemons"
For more information, see Skwish. Flemons wrote: Larger tensegrities begin to run up against limits imposed by weight and material strength. 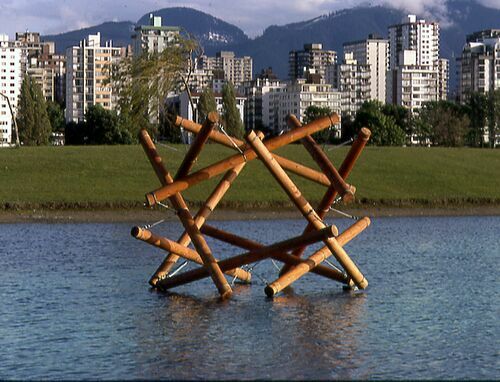 The Floating Logs sculpture for example weighs approximately 1000 lbs yet the tensional forces required to 'pull' it together exceed two tons. The larger the structure the lighter and stronger the materials need to be and the more fail safe the tensional components and linkages. 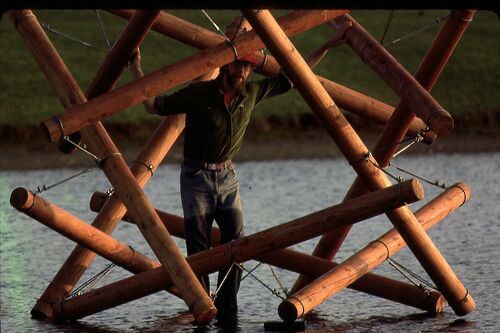 Floating Logs by Tom Flemons"
[[file:12_bird_strut_cuboctahedron_by_Flemons.jpg|thumb|500px|none|12 birds tensegrity by Tom Flemons" http://www.intensiondesigns.com/"
Table supported by 3 strut tensegrity, the struts are crutches. 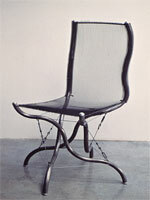 By Tom Flemons"
Chair supported by a three strut tensegrity, the struts are wavilinear. By Tom Flemons"
Compass Table: glass supported by 2 v-expanders and curved glass by Tom Flemons"
floating lampshade with 12 panels by Tom Flemons"
Ezekiel's Wheel, tensegrity elaboration of bicycle wheel, by Tom Flemons"
8 unit mast by Flemons plexiglass, front, by Tom Flemons"
8 unit mast by Flemons plexiglass, side, by Tom Flemons"
See Levin for a conversation between Flemons and Levin.